Piltdown Man is one of the most famous scientific hoaxes in history. A new paper in Royal Society Open Science provides compelling evidence that there was just one forger, rather than many. Also, the bones used to create the fakes came from a single orang-utan specimen and at least two human skulls. “The people at the Natural History Museum [in London] have never stopped looking at Piltdown Man,” lead author Isabel de Groote, a paleoanthropologist at Liverpool John Moores University in the U.S., told Gizmodo. As new technologies become available, the specimens are re-examined, in hopes of shedding light on the remaining mysteries. This time around, the analyses included CT scanning, ancient DNA analysis, spectroscopy, and radiocarbon dating. When paleontologist Arthur Smith Woodward and lawyer and amateur antiquarian Charles Dawson announced their discovery of unusual fossils in a gravel pit near the town of Piltdown in December 1912, it caused an immediate sensation. The two men claimed to have excavated human skull fragments and a distinctly ape-like jawbone with two worn molar teeth, along with some stone tools and the fossilized remains of animals. Since the bones were found next to each other in the pit, surely, the men argued, they all came from a single creature—technically called Eoanthopus dawsoni, but soon nicknamed Piltdown Man. Many hailed the find as the long-sought missing link proving that man and apes were evolutionarily linked. Woodward and Dawson presented a reconstruction of what such a skull might have looked like to the Geological Society of London that same month, speculating that the individual to whom it belonged must have lived 500,000 ago. More such fossils were excavated at the original Piltdown site over the next few years, including a canine tooth and an oddly curved slab of bone resembling a cricket bat. Group portrait of examination of the Piltdown skull by John Cook, 1915. Public domain. Back row (from left): F. O. Barlow, G. Elliot Smith, Charles Dawson, Arthur Smith Woodward. Front row: A S Underwood, Arthur Keith, W. P. Pycraft, and Ray Lankester. Dawson died in 1916, but the year before, he wrote to Woodward claiming he had found three more fossil fragments (including a molar) from another skull at a second site just a couple of miles from the first one. The Piltdown 2 site was never found, and Woodward didn’t present the new fragments to the society until several months after Dawson’s death. There were certainly skeptics within the scientific community when the discovery was announced, but eventually Piltdown Man was accepted as the real deal. It took 40 years before a team of researchers at the British Museum uncovered the fakes in 1953, using the then-new technique of fluorine dating. They found that the bones were not all the same age. The upper skull was 50,000 years old, and the ape-like jawbone just a few decades old, most likely taken from a modern orang-utan. There was also evidence that the jawbone had been stained with potassium dichromate to give it an older, reddish-brown appearance. So it was clearly a hoax. But was Dawson the sole perpetrator, or did he have help from a fellow forger? Or was it someone else entirely? Woodward, at least, seems to have a been a true believer, continuing the search for more such fossils until his death in the 1940s. One suspect was Martin Hinton, a British Museum staffer who didn’t like Dawson and may have nursed a grudge. Some surmised he may have planted additional fossils after the first “discovery,” as a way to discredit his adversary—or at least let Dawson know he was onto him. Still others have argued that a young French priest named Pierre Teilhard de Chardin, who was present when the canine tooth was found, may have planted that particular artifact. Even Sherlock Holmes creator Sir Arthur Conan Doyle made the list of suspects, since he lived near Piltdown, was a paleontology buff, and was rather hostile to the theory of evolution. This latest analysis exonerates the usual suspects and pins the blame on Dawson alone, since the forger’s modus operandi was so consistent among all the fakes, and a limited number of specimens were used to create all the fake fossils. He brought the first fossils to Woodward, and nobody ever uncovered a new specimen when he wasn’t present at the site. 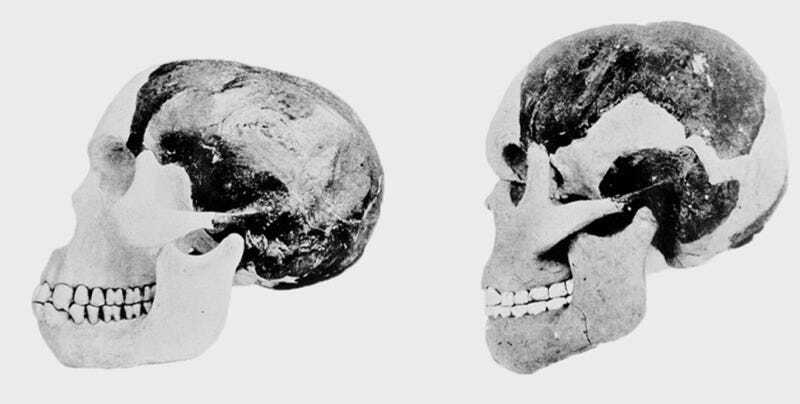 No more Piltdown fossils were found after Dawson’s death in 1916. He had the necessary access and connections, and he knew that the British scientists would expect to see “a large brain, ape-like face and jaws, and heavily fossilized materials that indicated great antiquity” in any missing link, the authors write. And Dawson turned out to be a prolific forger—at least 38 fake finds, according to de Groote, including a stone axe, a fraudulent flint mine at the Lavant Caves, and what he claimed was one of the first bronze statuettes linked to Roman times. “He clearly had been doing this for a very long time,” she said. Not coincidentally, the paper’s been published on the 100th anniversary of Dawson’s death (August 10, 1916). The CT scans and DNA sequencing analysis show quite clearly that the teeth and jawbone came from a single orang-utan, most likely a relative of the apes found in Borneo. Two or three human skulls were also used in the forgery, likely dating to the medieval period. There was gravel from Piltown in the bones and teeth, and also a kind of putty—what a dentist would have used at the time to make a white filling. The putty had been used to fill holes and repair broken bones, and there was evidence that the molars had been removed and then re-set in the jaw. This clearly links the fossils found at the Piltdown 1 and Piltdown 2 sites. So is the case now closed? Not quite. At least one paleoanthropologist isn’t ready to exclude the possibility that Dawson had an accomplice—namely, the French priest, Teilhard de Chardin, who had a reputation as being a prankster, according to Francis Thackery to the University of Witwatersrand in South Africa. “My view is that Teilhard was an advisor to Dawson and that the motive behind the forgery was that it was initially a joke against [Smith] Woodward,” he told Science magazine. The paper is surprisingly readable, due in large part to de Groote’s desire to “write the story rather than a [typical] science paper,” thereby providing a unifying framework for the different analyses. Because let’s face it: it’s one hell of a story. And in this case, that story enhances, rather than detracts from, the scientific content. There’s even a section speculating about Dawson’s possible motivations, based on historians’ analysis of the many letters and papers Dawson left behind. “That’s the hardest thing for me as a scientist, to do,” de Groote admitted. “I look at numbers and images, I say this is right or wrong.” The question of why is much more difficult to answer, but Dawson certainly had high ambitions for his scientific career, complaining in a 1909 letter that he was still waiting for that one “big ‘find’” that would cement his reputation and earn him a fellowship with the Royal Society.